The SUV whizzing past our vehicle had caught my imagination. Painted bright sky blue, the one seemingly copyrighted by the United Nations, this one, I later noticed, did actually belong to the comity of nations. But then, what exactly was a vehicle carrying a UN flag in the front and a blue, again UN, number plate on the back doing on the dilapidated and dusty roads of Nepalgunj? And why did it have a huge jammer along with the UN insignia? ‘The war is over, is not it?’ I asked the friend accompanying me. ‘No, wars never end in Nepal,’ she replied looking out of the window. Her gaze was fixed in vacuum. The abandon in her voice had disconcerted me enough not to probe any further. The only sound that remained was that of the vehicle. The monotony of the sound had doomed it to fade and an eerie silence was slowly settling inside. 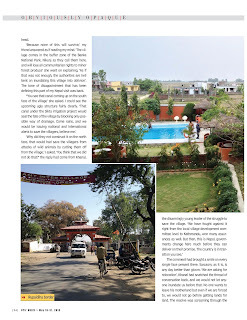 Even Dhrub, our driver, who had pleasantly surprised me with his strange, but melodious, habit of humming something all the time he drove, had gone silent. ‘Nepalis do not believe in a closure,’ said my friend breaking the gloom. ‘We are a country where dynasties have been trying to claim and reclaim the throne for more than 200 years now, and no victory is ever complete till it’s finally upstaged by a rival. And I so wish that your country had not always had played a role into those power games.’ Her eyes, this time, were fixed at me, unsettling me even more. I could not decide what exactly that stare meant. From a probing gaze to a sweeping statement that did not carry any emotions, it could be anything. ‘Don’t you worry’, sensing my unease she told me. ‘Nepalis have yet not lost the capacity of differentiating between friendly citizens and the big brotherly rulers that inhabit the lands on the other side of Rupaidiha border.’ She had broken into a giggle. Dhrub looked back and started humming again. ‘What about the war though, the janyuddh (people’s war),’ I had gathered myself back to be able to give words to what was bothering me ever since I had seen the UN vehicle with the jammer. The war, in any case, was centered in the western and mid-western Himalaya I had just returned from. It was, like any other war, fierce and brutal but had not affected the Terai in the same way it had devastated the mountains. 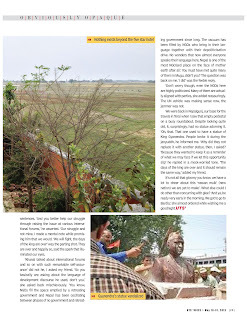 The Maoists, of course, have launched some daring attacks in the districts that formed the plains that gave Nepal almost all its homegrown food and had won some glorious victories. The royalist army, on its part, has been as ruthless in its efforts of suppressing them as it was in mountains. No, I am not suggesting that it was a war between the good and the bad and Maoists were the ‘good’ in the same. The war, like any other one, had seen both sides indulging in grave violations of human rights and dignity. Yet, all the evidences suggest that the army has much more to account for than the Maoists. 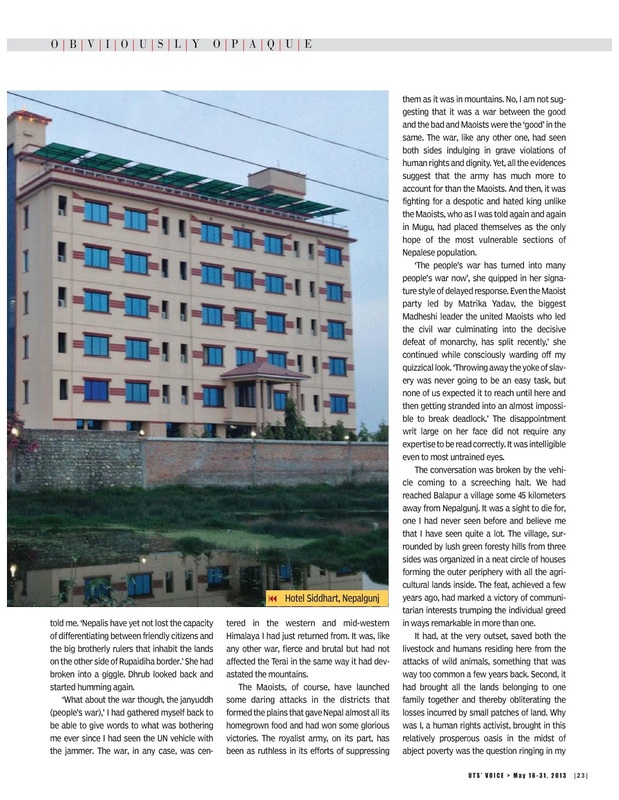 And then, it was fighting for a despotic and hated king unlike the Maoists, who as I was told again and again in Mugu, had placed themselves as the only hope of the most vulnerable sections of Nepalese population. ‘The people’s war has turned into many people’s war now’, she quipped in her signature style of delayed response. 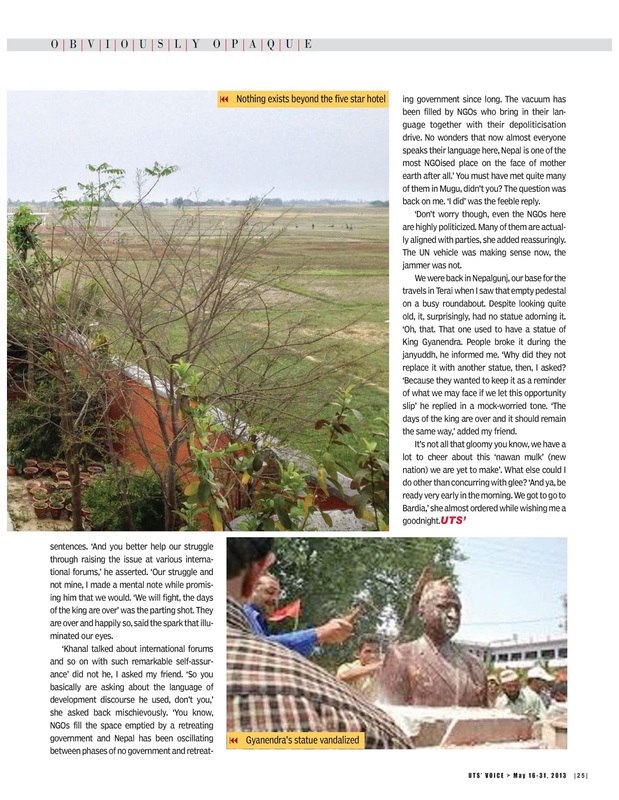 Even the Maoist party led by Matrika Yadav, the biggest Madheshi leader the united Maoists who led the civil war culminating into the decisive defeat of monarchy, has split recently,’ she continued while consciously warding off my quizzical look. ‘Throwing away the yoke of slavery was never going to be an easy task but none of us expected it to reach until here and then getting stranded into an almost impossible to break deadlock.’ The disappointment writ large on her face did not require any expertise to be read correctly. It was intelligible even to most untrained eyes. The conversation was broken by the vehicle coming to a screeching halt. We had reached Balapur a village some 45 kilometers away from Nepalgunj. It was a sight to die for, one I had never seen before and believe me that I have seen quite a lot. The village, surrounded by lush green foresty hills from three sides was organized in a neat circle of houses forming the outer periphery with all the agricultural lands inside. The feat, achieved a few years ago, had marked a victory of communitarian interests trumping the individual greed in ways remarkable in more than one. It had, at the very outset, saved both the livestock and humans residing here from the attacks of wild animals, something that was way too common a few years back. Second, it had brought all the lands belonging to one family together and thereby obliterating the losses incurred by small patches of land. Why was I, a human rights activist, brought in this relatively prosperous oasis in the midst of abject poverty was the question ringing in my head. ‘Because none of this will survive,’ my friend answered as if reading my mind. 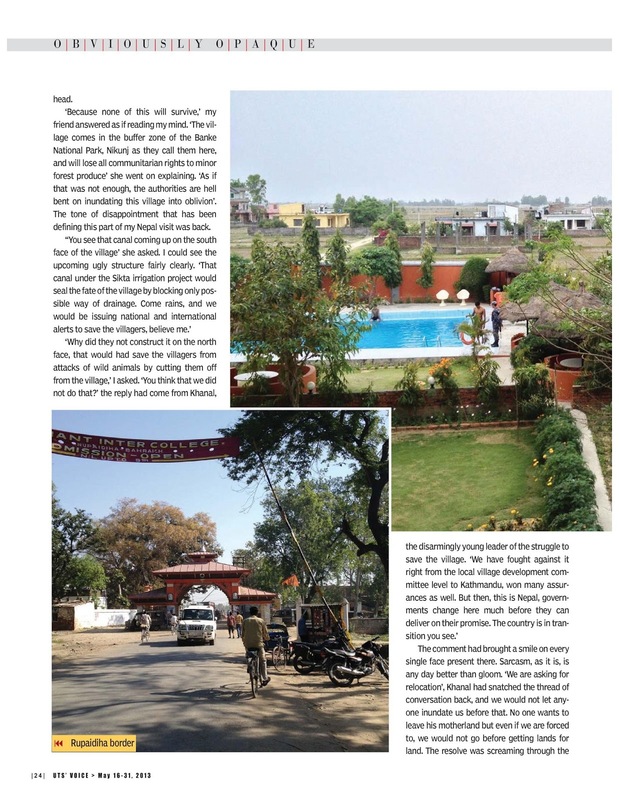 ‘The village comes in the buffer zone of the Banke National Park, Nikunj as they call them here, and will lose all communitarian rights to minor forest produce’ she went on explaining. ‘As if that was not enough, the authorities are hell bent on inundating this village into oblivion’. The tone of disappointment that has been defining this part of my Nepal visit was back. The comment had brought a smile on every single face present there. Sarcasm, as it is, is any day better than gloom. ‘We are asking for relocation’, Khanal had snatched the thread of conversation back, and we would not let anyone inundate us before that. No one wants to leave his motherland but even if we are forced to, we would not go before getting lands for land. The resolve was screaming through the sentences. ‘And you better help our struggle through raising the issue at various international forums,’ he asserted. ‘Our struggle and not mine, I made a mental note while promising him that we would. ‘We will fight, the days of the king are over’ was the parting shot. They are over and happily so, said the spark that illuminated our eyes. 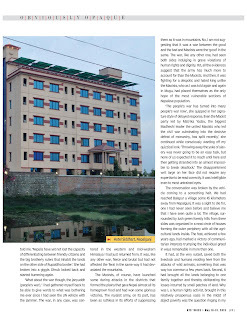 ‘Khanal talked about international forums and so on with such remarkable self-assurance’ did not he, I asked my friend. ‘So you basically are asking about the language of development discourse he used, don’t you,’ she asked back mischievously. 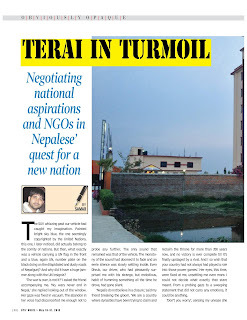 ‘You know, NGOs fill the space emptied by a retreating government and Nepal has been oscillating between phases of no government and retreating government since long. The vacuum has been filled by NGOs who bring in their language together with their depoliticisation drive. No wonders that now almost everyone speaks their language here, Nepal is one of the most NGOised place on the face of mother earth after all.’ You must have met quite many of them in Mugu, didn’t you? The question was back on me. ‘I did’ was the feeble reply. ‘Don’t worry though, even the NGOs here are highly politicized. Many of them are actually aligned with parties, she added reassuringly. The UN vehicle was making sense now, the jammer was not. 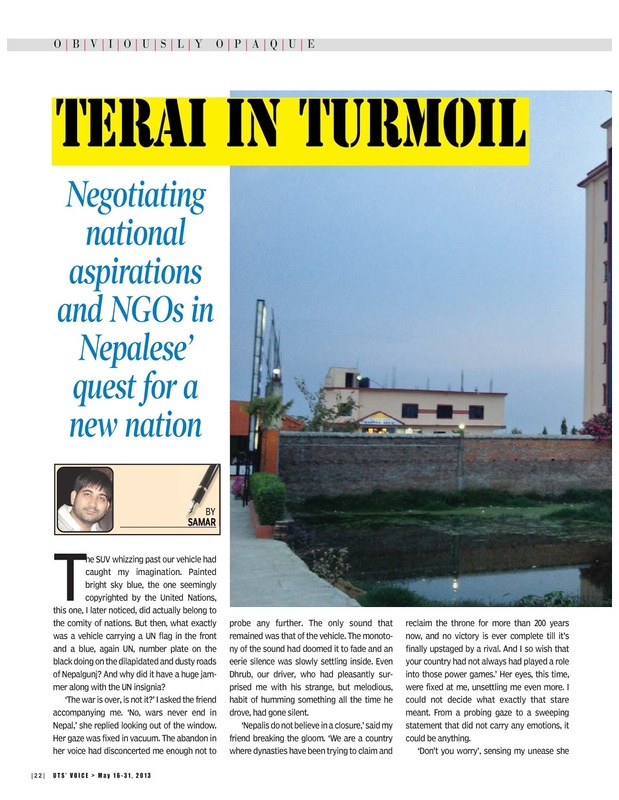 We were back in Nepalgunj, our base for the travels in Terai when I saw that empty pedestal on a busy roundabout. Despite looking quite old, it, surprisingly, had no statue adorning it. ‘Oh, that. That one used to have a statue of King Gyanendra. People broke it during the janyuddh, he informed me. ‘Why did they not replace it with another statue, then, I asked? ‘Because they wanted to keep it as a reminder of what we may face if we let this opportunity slip’ he replied in a mock-worried tone. ‘The days of the king are over and it should remain the same way,’ added my friend. It’s not all that gloomy you know, we have a lot to cheer about this ‘nawan mulk’ (new nation) we are yet to make’. What else could I do other than concurring with glee? ‘And ya, be ready very early in the morning. We got to go to Bardia,’ she almost ordered while wishing me a goodnight.